Earlier this year I adopted my second cat. I joke that a cat was the only thing a woman should buy herself when she’s in her late 20s and still single. Actually, I didn’t intend to have two cats. 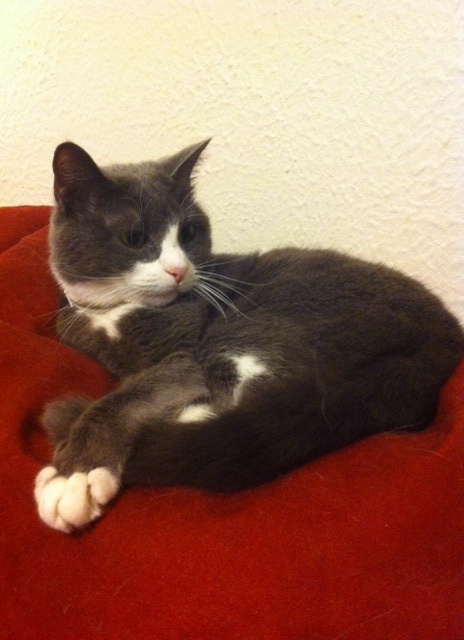 I was happy with Mouse, a small gray thing I’ve had since 2008 when I first moved out on my own. But I was browsing through the adoptable pets at Petsmart one day when I saw him — the prettiest long-haired orange cat I’d ever seen. I just had to have Frank. “How many cats can I have before I’m a crazy cat woman?” I wondered aloud, and even asked the question on Facebook. But I’m beginning to think maybe “crazy cat lady” isn’t about the number of cats you have. In other words having two cats doesn’t make me a cat lady, but maybe the following does. You decide whether or not to wear a clothing item based not on if there’s cat hair on it, but the amount of said cat hair. I mean, cat hair is a way of life. 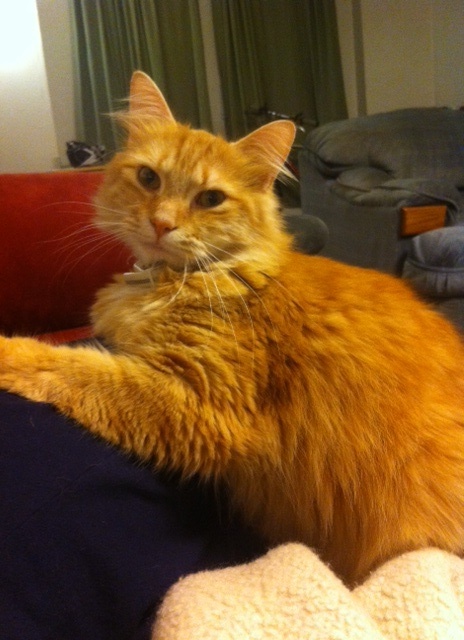 I gave up trying to be completely hair-free when I adopted a long-haired orange cat. A little hair is OK and a lot of hair can be usually be fixed with a lint roller. 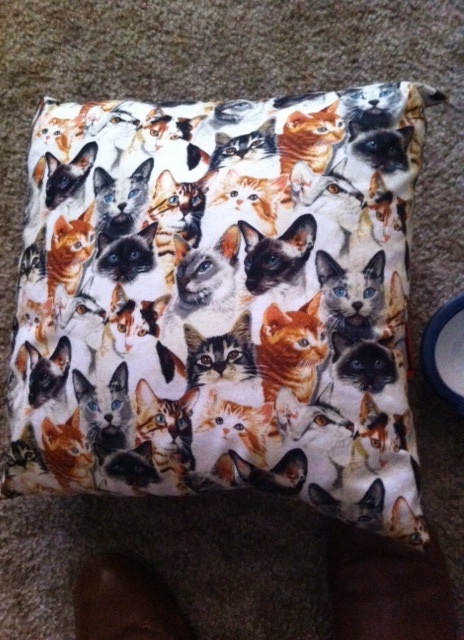 Someone offers you a pillow with cat faces all over it, and you accept it. “This would look great beside my cat figurines and cat-training books,” you say. OK, I don’t really have cat figurines or cat training books. But my aunt gave me this pillow the other day. She said she thought of me when it came into her possession. Isn’t it fabulously tacky? There was also a cat soap dispenser, Brillo Pad rest and three cat books. “Oh. My. God. Are they grooming you to be a crazy cat lady?” That was the response I got from a friend when I sent him a picture of all my new cat things all laid out in a row. I think I may be well on my way, no grooming needed. Hearing about a strangers cat dying makes you cry. Again, this happened to me this week. I was curled up in bed under my electric blanket with my cats laying on top of me, reading Slate. In one article, the writer thought her cat told her she was going to die. That story had me choked up twice. And I very rarely cry. Read it for yourself if you need a good cry. You keep lint rollers in your car, at your front door and at your desk at work. Just in case. Your Instagram feed is two-thirds cat pictures. (And your friends probably secretly hate you for it). The Instagram and Twitter accounts you follow are two-thirds cat pictures. You celebrate National Cat Day by changing your Facebook profile pic to a cat selfie and posting more Instagram pics of your pride. It’s early November and you’re already thinking of what your cats might want for Christmas. A typical first date question for you is, “Are you allergic to cats?” Because if it’s him or the cats, it’s the definitely the cats. Change it to dogs and I’m totally there on most of these– especially #9. And I like that there it is a list of nine- just like nine lives! Ha, yeah I totally meant to do that.. Totally. We’re just welcomed our first kitten Belle to the Adams-Wintz family. Welcome to the “cat people” club!